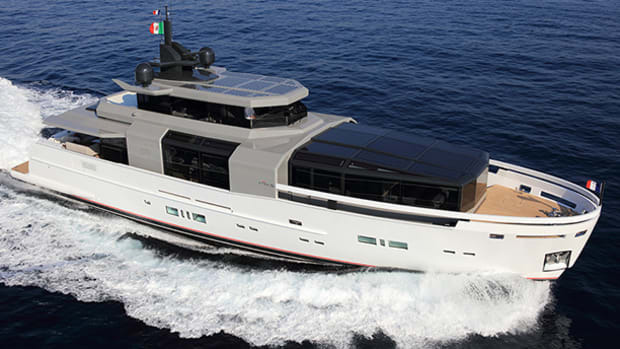 It’s an arduous task to create a 33-footer with all the necessary accommodations, plus room to spare. 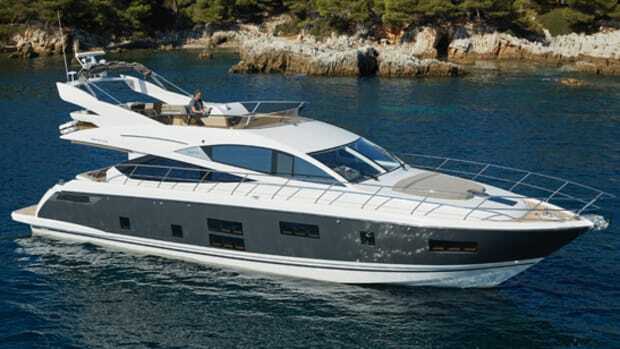 Bill Dixon faced that challenge head on with the Sealine C330. The life of the superyacht designer is very much like that of the marine journalist. You wake up between silken sheets, and breakfast under the vines on a sun-dappled patio. Swim, shower, check your e-mails, make a few calls, and then knuckle down to a couple of hours of serious creative work. In the afternoon, you go sailing. I exaggerate, of course. You never do two hours at a stretch. My point is that superyacht designers have it easy compared to designers of small craft. They would take issue with that, no doubt, because aboard any boat, however big, there probably never seems to be quite enough space to fit everything. 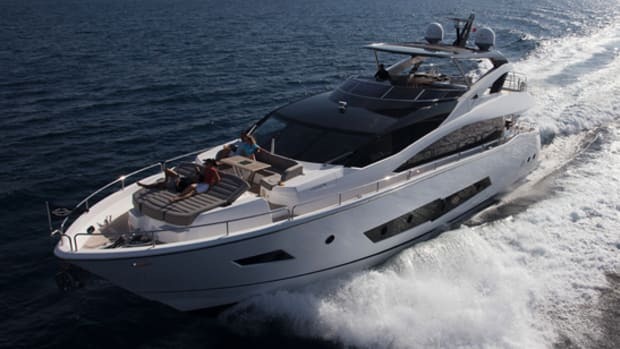 But the difficulty of keeping the profile of a 140-footer looking sleek while retaining 6 feet, 8 inches of headroom in the saloon and amidships cabin pales in comparison to the difficulty of getting any kind of saloon worthy of the name into a 33-foot hull. Designing good small boats is hard. 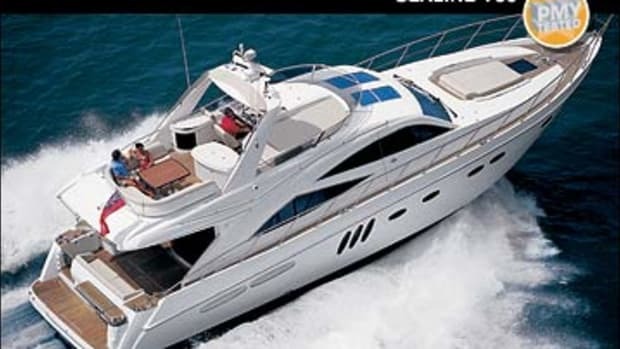 Sealine, the British marque now owned by Hanse Yachts, molded at Hanse’s plant in Poland, and fitted out on Germany’s Baltic coast, was always sharp at design. The boats looked distinctive and were often full of good ideas—and because it was a yard known for its smaller boats, those ideas often involved the inventive interpretation of space. There were ingenious stowage solutions. Amenities you didn’t know were there, such as tables and awnings, revealed themselves in surprising ways. The boats felt bigger than they looked. 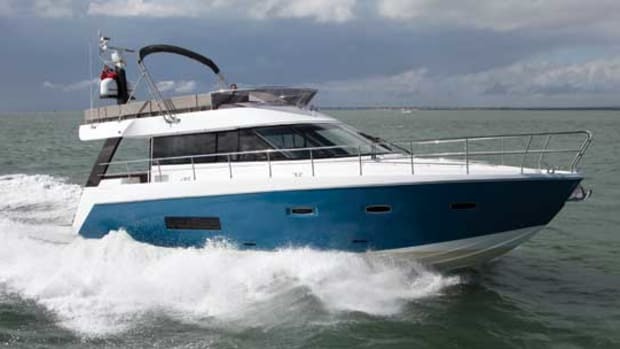 When Hanse took over Sealine in 2013, it shipped the molds for a couple of models across the English Channel, to maintain some brand continuity while it worked on new designs. The S330 was introduced in 2014, and although the C330 appears at first to be an enclosed version of that sports cruiser, there’s much more to the new model than a door across the cockpit. 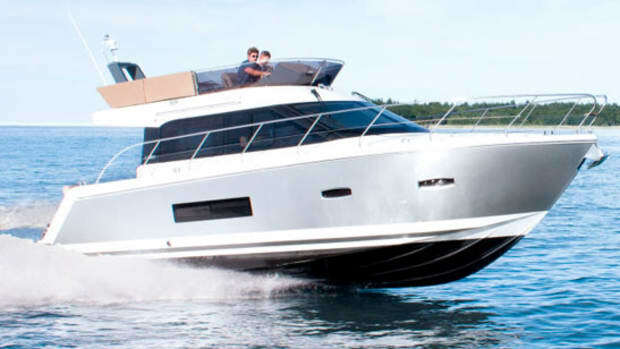 Where the sports cruiser was designed as an “open,” as the Italians say, with forward-facing bench seats and its galley and saloon down below, the C330 has the sociable Scandinavian style of main deck, with a galley along the starboard side, a big dinette, and a single helm seat. The modifications have also allowed for a complete redesign of the lower deck, where everything has changed, apart from the position of the engine room bulkhead. Both cabins have expanded to absorb the space vacated by the saloon, and there’s considerably more stowage volume. Headroom at the doorway of the forward cabin is an impressive 6 feet, 3 inches, and the berth is a full-size double. And while amidship staterooms on boats this size are basically upholstered caves tucked under the cockpit sole, the C330’s is a big one, with 6-foot-plus headroom in the entrance area and just under 3 feet of clearance over a truly massive bed that measures 6 feet, 8 inches by 6 feet, 10 inches. According to Sealine, it’s intended as a kids’ cabin, and it looks perfect. The space that will really sell this boat, however, is the saloon. Almost entirely glass-sided, and with a big, sliding sunroof, it feels bigger than it should. And it actually is. Thanks to the ingenious offset asymmetry of the C330’s superstructure—the port side deck is a mere shelf, just 5 inches wide, compared to 10½ inches on the starboard side—the saloon on the C330 benefits from nearly 6 inches of free width, all down the port side. The port side deck is also higher than the starboard, to create extra volume to the guest cabin. This is radical thinking, with immediate, tangible results: small boat design at its best. 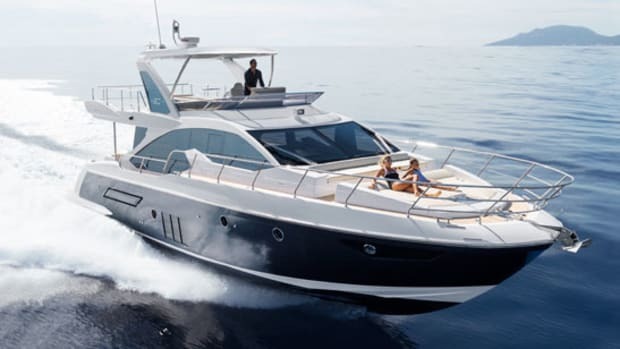 With such a brilliant outline, making the C330 into a winner was simply a matter of applying all the clever features for which Sealine has always been renowned. It’s clear that, new owners or not, the marque has not lost its touch. A two-part sunroof allows the sun to pour in—but only where you want it. A door to starboard of the helm doesn’t require a gymnast’s flexability to step through. Want a custom hull color? Sealine will paint the boat any color you want from the Alexseal catalogue. Large analog gauges at the helm are a salty touch. The berths aboard are some of the largest available in this class of boat. A sliding canopy extends to shelter the cockpit, and on the starboard side of the saloon there’s the option for a TV that can be folded out to face the aft bench seating. The cockpit door is double-hinged to fold out of the way to port, while the glass panel to starboard hinges upward to give the chef some air. In a very neat touch, the teak top to the cockpit cabinet folds out to create a usefully sized galley serving counter. 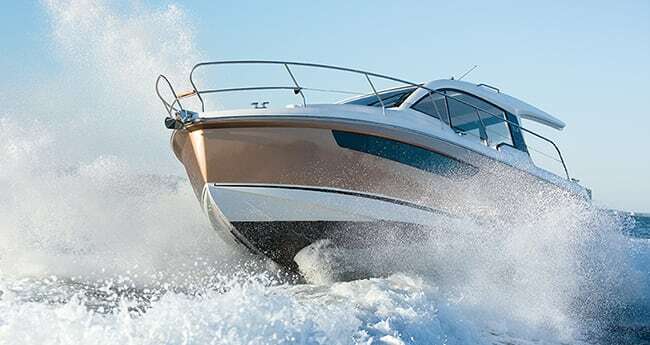 Of course, Sealine was always known for lively performance, too, and even with its relatively modest 220-horsepower and relatively heavy twin-engine installation, our test C330, the first off the line, turned in a more than respectable showing. Maybe it lacked the ­urgent pickup of a true sports machine—the beefy, single, 400-horsepower option might deliver in that department—but once up on the plane and barrelling along at 20-plus knots, the boat showed itself to be possessed of the kind of sure-footed and lively handling that flatters your driving skills, without giving you any unease that hard or cack-handed helming might cause it to get out of shape. The top line is pretty impressive, too: just over 30 knots on our averaged two-way runs, and a range of economical cruising speeds, loaded down as we were on the day, from 20 knots up to about 26. 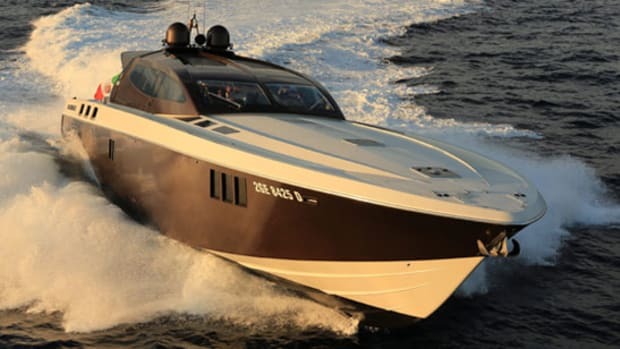 With a safe margin to that 151-gallon fuel capacity, the C330’s endurance at 25 knots would be some seven hours. 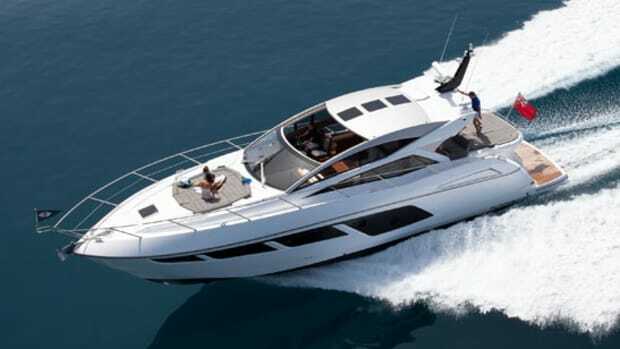 Speedy and smart, Sealine’s new C330 ticks the boxes for a family in search of a cruising weekender. But it’s in terms of space planning that this boat is most impressive—a three-dimensional tour de force. Oh, and the hard-working designer behind all this? It turns out to be none other than British naval architect Bill Dixon, who also has something of a reputation in the world of superyacht design. OK, maybe he doesn’t spend all of his afternoons sailing. NOTEWORTHY OPTIONS: 2/220-hp engines ($24,759). Comfort package ($11,372): teak cockpit floor; cockpit fridge; electric toilet; freshwater washdown; LED cockpit lighting; folding foredeck cushions. Cruising package ($11,609): 4-hp bowthruster; electric windlass; Delta anchor and chain; spotlight; adjustable steering wheel; trim tabs; midships cleats; cockpit covers; fenders and lines. 40 gal. fuel, zero water, 4 persons, 200 lb. gear.